Improved anti-tangle technology keeps robot from getting stuck on cards, carpet fringe and tassels. It can skip through 2CM height wire smoothly. It is with climbing ability, which can climb up to 45 degree slope. Preset any time in the cleaning day or some days or everyday of one week so that it can clean your house automatically while you are working or on business trip. It is with dirt detection function. During the operation of the robot, if it reaches a place with a lot of dirt or debris, the robot will increase intensity to such area and prolong the cleaning time. 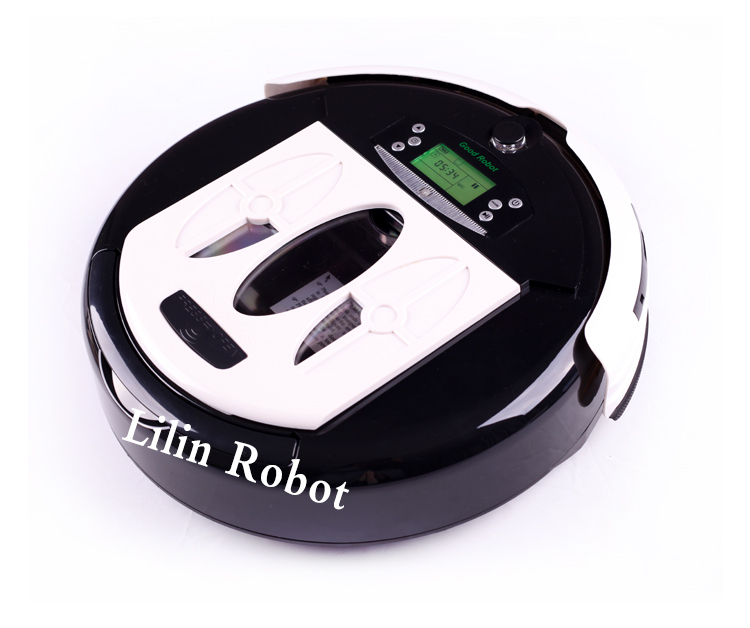 It can identify various abnormal condition and the indicator will flicker accordingly once there is a problem during cleaning process, such as low power/ side brushes need to be cleaned/ the dustbin is not setup/rolling brush ,slider brush or wheel gets something wrong, which can be indicated directly through LCD display. Personalized cleaning mode to meet different cleaning need for different families to achieve the most perfect cleaning efficiency. Auto cleaning mode: maximum cleaning coverage; Spot cleaning mode: partial cleaning, cleaning along the walls or furniture. Compare with similar robots in the market, it is with the lowest noise so that you can focus on work or study while cleaning. Single motor to control side brush’s work to make robot even more efficient at cleaning edges and corners. 8 UV Lamp for Sterilization with Fragrance. Turn on the UV lamp during the cleaning process for sterilization, you can choose the fragrance function as well. The mopping part is mainly designed to cooperate with Robot adjunctively to fulfill cleaning floor. The mopping, which is made of high fiber, is with high absorb ability of water. It can be used in wet and dry condition. Large capacity of dustbin: Pick up more hair and debirs and easier to be removed. Filter functions can avoid secondary pollution effectively and don’t dirty the hands. The virtual wall is an accessory. It sends some special IR signals to form a blocked area to prevent the cleaner from entering unnecessary areas. It is so named”virtual wall” because this function acts like a wall. When it is in “docking” mode, it will searching the charging dock station after work and enter the standby status. The robot will automatically start to search the charging dock station for recharge when the battery level is lower than 15% during the cleaning process. The robot will remember work schedule and go on cleaning work after charging. The package include 10pcs of disposable bag for dustbin.